Fascinating fact: Dogs have a sense of smell that’s between 10,000 and 100,000 times more acute than ours! 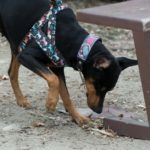 The sport of Scent Work celebrates the joy of sniffing, and asks a dog to sniff to their heart’s content; turning your dog’s favorite activity into a rewarding game. It is a terrific sport for all kinds of dogs, and is a wonderful way to build confidence in a shy dog. The sport of Scent Work is based on the work of professional detection dogs (such as drug dogs), employed by humans to detect a wide variety of scents and substances. In AKC Scent Work, dogs search for cotton swabs saturated with the essential oils of Birch, Anise, Clove, and Cypress. The cotton swabs are hidden out of sight in a pre-determined search area, and the dog has to find them. Teamwork is necessary: when the dog finds the scent, he has to communicate the find to the handler, who calls it out to the judge. Below find German Pinschers who have earned Scent Work titles. Copyright 2018 The German Pinscher Club of America, Inc.